Is it hard to be inspired by the great Lisa Pace? I don't think so! From the moment I met her I knew she was a gem and that she would be an inspiration to me in so many ways. In truth, she is the inspiration behind this website. I have read everything she has written and listened intently any time I was fortunate enough to hear her speak. And in every way, she says to us, "Dream and then work toward your dream". Maybe those aren't here exact words...but that is what I hear when she speaks. She encourages artists to reach for the stars. And so in my little way....my website is helping me reach for some stars. Not sure what I'll find...but I am reaching. 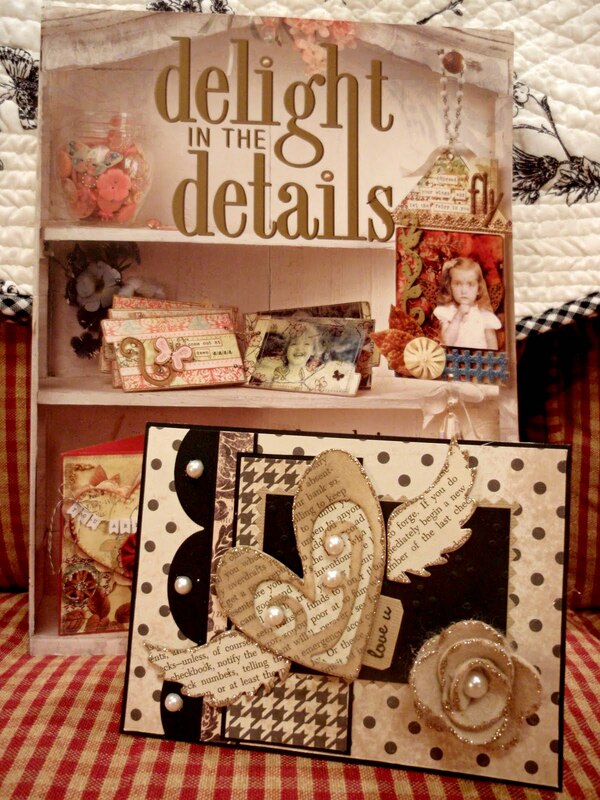 Her first book Delight in the Details is filled with projects to delight and inspire. She loves vintage finds, flowers, pearls and putting things together in unique ways. One time I loaned my copy to a friend and didn't sleep a wink until I got it back. This book can never leave me again....I need my rest! And now there is even more good news - Lisa's new book, Delight in the Seasons is now available for pre-order from Amazon. So what makes today's project so very Lisa inspired? It could be the vintage book paper, the creamy brown ink, the platinum Stickles, the felt rose or the pearls....but most likely it is the combining of all of that which makes it so Lisa. I used three dies to make this card and have listed them below. The card itself is just layered with coordinating papers and then embellished using the dies, a small stamped image and some pearls. The card layout is from this week's Wednesday Sketch at MFT Stamps. You can check out their forum each week for a new challenge. So I leave you with the hope that you will get to know Ms. Lisa Pace and will benefit from her inspiration. I will keep a link to her present book as well as a link to pre-order her second book right here on my website.